A. A. Collins, Cinedelphia’s Portland-based correspondent, reports from the 2012 Portland International Film Festival. Philippe Falardeau’s (It’s Not Me, I Swear!) 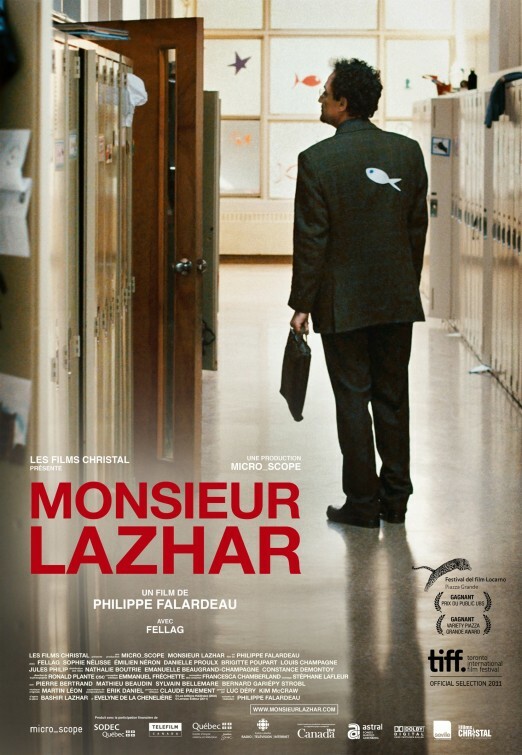 quiet, well-acted Monsieur Lazhar, Canada’s Best Foreign Language Film Oscar nominee, seeks to understand grief and its effects on those left behind. Falardeau also writes the screenplay, based on the play by Évelyne de la Chenelière, making a flawed movie with a great lead performance. In a snow-filled Montreal morning, a beloved grade school teacher hangs herself in her classroom, apparently with full knowledge that one of her students will find her there. This baffling act shocks the entire school, its rippling effects soon reaching the entire community. A grief counselor is brought in to work with the kids by the school’s principal, Mme. Vaillancourt (the excellent Danielle Proulx). She is eager to forget the incident, painting over the classroom’s walls in an attempt to start fresh. Meanwhile, no candidates for the vacant teaching position appear. Enter Algerian immigrant Bachir Lazhar (Mohamed Fellag), who shows up in Mme. Vaillancourt’s office, keen to take over as the kid’s new teacher. Lazhar’s old-fashioned ideas and dubious background make the principal reluctant to offer him the job, but with no other options, she relents. At first, her misgivings seem to be confirmed by Monsieur Lazhar’s archaic teaching methods— chief among them a penchant for dry Balzac dictation and the re-arrangement of the classroom desks from a semi-circle to straight rows— and more direct, foreign ways. However, he develops the sort of rapport with his charges all too common in the “teacher” film, though adherence to this trope does not make the bond between Bachir and the children any less earned. He is the only adult in the film that engages the kids as people instead of victims. Lazhar’s readiness to dig up painful memories and ask questions about a past most rather forget puts him at odds with Mme. Vaillancourt, other faculty members, and the children’s parents. Conversely, this earns him the trust and admiration of the kids and some of his most progressive colleagues. He encourages the children to speak freely about their grief as they seek to make sense of the scarring experience. As Bachir works with his students to overcome their sense of loss and, in some cases, guilt, the mystery of his own past and the secret grief that consumes him ominously hang over the proceedings. Contrary to the naked honesty he advocates in the classroom, Bachir keeps his pain hidden. The details of the terrible tragedy that befell him in Algeria come to light in a few tense courtroom scenes as he pleads for political asylum. When exploring the Bachir backstory and the checkered relationship between the dead teacher and a troubled student, Monsieur Lazhar vacillates. The story makes explicit what Fellag’s performance has already conveyed and adds unnecessary baggage to the film. The time spent solving these “mysteries” takes away from the power and immediacy of the main story. The courtroom scenes, with an insensitive, probing prosecutor and school staff meetings telegraph unnecessary points that subtext has already made clear and drag the film down. This might be due to the film’s stage origins and a failure of Falardeau’s to properly translate its source to a different medium. An additional distraction is the obligatory romantic interest. The hippy-ish Claire (Brigitte Poupart), a fellow teacher, drops not-so-subtle hints to Bachir, who timidly rebuffs her. Their awkward courtship finally leads to a funny, but out of place, scene in Claire’s apartment that drives home some of the film’s geo-political themes. The film seems to be commenting on the fetishistic admiration of the “exotic” foreigner by white-guilt ridden liberals, but the scene feels jarring and makes the likeable Claire seem like a simpleton straight out of “Stuff White People Like.” It’s a shame that the film takes these distracting detours, because otherwise this is a well-crafted story with some fantastic performances. And, ultimately, the film’s biggest strength is in these performances. Fellag, a famous comedian and playwright in France and Algeria, anchors the film with his brilliant portrayal of the titular character. He is equally genial, somber, and darkly funny; his facial expressions convey warmth and trustworthiness while underscoring the character’s inner pain. He is your typical fish out of water, a bit bumbling and unsure, but Fellag adds another dimension: a quiet dignity that carries Bachir throughout the film and defines his character. He underplays Lazhar beautifully and his scenes with the kids have real chemistry. Of the children, the film mainly focuses on two: the angry, troubled Simon (Émilien Néron) and sensitive Alice (Sophie Nélisse). They are both fantastic, particularly Nélisse whose Alice develops the closest bond with Bachir, becoming his “favorite” as he steps in as much needed father-figure (another clichéd trope in this kind of film, but the interaction between the two actors make it palatable). 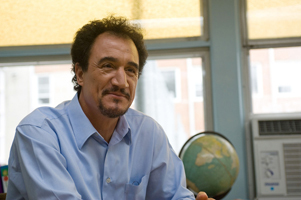 Simon’s arc develops slowly, as hints of his troubled past with the dead teacher appear throughout the film until the cathartic scene where feelings explode and emotions are addressed. This feels a bit forced and does not jell with the subtlety in which these scenes between the kids had played out throughout the movie. Falerdeau shows a sure directing hand, facilitating great performances out of his excellent cast. A more focused screenplay would have served the excellent performances better and made Monsieur Lazhar a must-see. Regardless, there is plenty to recommend and Fellag’s performance alone makes this movie worth checking out.